Ballymacelligott civil parish (Ballymacelligott Church of Ireland parish). 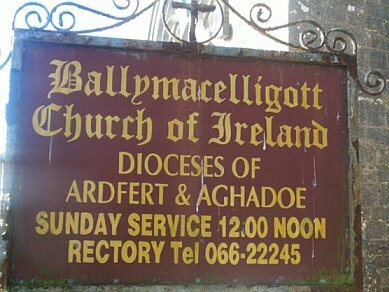 go to "Ballymacelligott Births, Marriages & Deaths 1817-1856"
go to "Ballymacelligott Confirmations 1885-1945"
go to "Ballymacelligott Marriages 1845-1955"
The present Ballymacelligott church was built in 1824. An earlier church stood a short distance to the south. ROBERT GROVES. 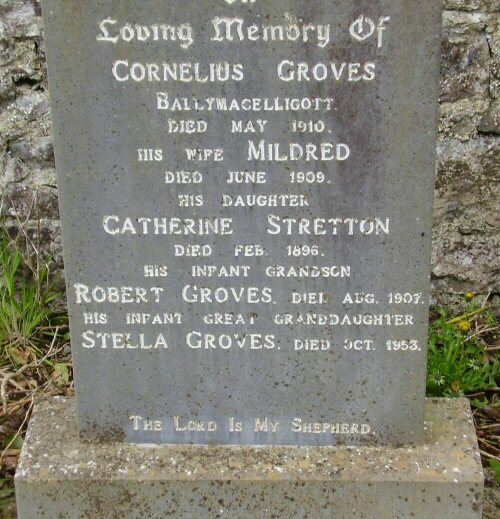 DIED AUG 1907. STELLA GROVES. DIED OCT. 1953.